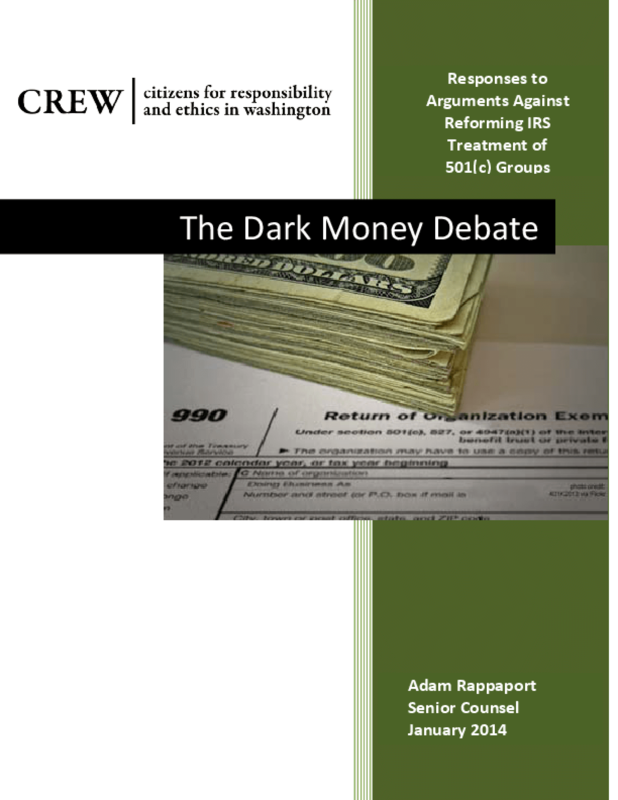 The Dark Money Debate: Responses to Arguments Against Reforming IRS Treatment of 501(c) Groups, responds to arguments against proposed reforms that would rein in abuses of tax-exempt organizations for political purposes. Four years after the Supreme Court's disastrous Citizens United decision opened the floodgates allowing dark money groups to influence elections, there is a concerted effort to keep this system in place and even extend First Amendment constitutional protections to prevent regulation of groups organized under section 501(c)(3) and (c)(4) of the tax code. CREW's paper directly addresses these fallacious assertions. Copyright 2014 Citizens for Responsibility and Ethics in Washington.